Bangladesh’s current successes in health are impressive, and I am pleased to share some of them. Bangladesh has a small land area (147,570 km²), but huge population (>150 million). We dream of being a middle-income country with a clear and well defined Vision 2021. It gives priority attention to social determinants of health. Our National Health Policy 2011 reflects the same vision, and emphasises ICT integration in management. Recently United Nations’ Secretary General Ban Ki Moon, during his visit to Asia, mentioned Bangladesh as an EPI success model in the continent. It is worth mentioning here that Bangladesh received the MDG4 Award from the United Nations in 2010. The most recent Maternal Mortality Survey (2010) shows an impressive progress in declining MMR by a figure of 66% between 1990 and 2010 from 574 to 194 per 100,000 livebirths. We are now confident that we would be able to achieve MDG5 by the 2015 dateline. To further improve maternal health service, we are producing an additional 3,000 midwives, as promised by our Honourable Prime Minister Sheikh Hasina, in the United Nations High Level Meeting in 2010, to ensure safe pregnancy and childbirth for women. Additionally, we carry out a Demand Side Financing Scheme to enable pregnant women receive any kind of maternal healthcare. Our Ministry of Health is working to introduce universal health coverage for all citizens beginning with population at marginal level. We have established community clinics to make available essential health care on the doorsteps of citizens. As of July 2012, about 12,000 community clinics are operating and a further 6,000 community clinics are planned. These clinics are run under a principle of community ownership to act as focal points for health awareness campaigns and delivering basic health care. Some community clinics have started child birthing services. Another recent success of Bangladesh Health System is its digitalisation on a national scale, which is expected to reach a fully matured stage by 2016. Started in early 2009, we have already achieved much progress and received global attention. The Commission on Information and Accountability on Women’s and Children’s Health of the United Nations recognized our ICT-based national health information system as an appropriate model for collecting MDG4 and 5 data. The United Nations provided Bangladesh Digital Health for Digital Development Award in 2011. However, the economic transition has brought the country new challenges of increasing NCDs accounting 61% of national disease burdens. In this context, I appreciate the Commonwealth Secretariat’s role in raising awareness of the national health leaders on the link between communicable and non-communicable diseases. Bangladesh has undertaken appropriate programs to combat this dual disease burden in coordinated manners and mainstreamed with primary health care system. I would recommend more country collaboration in this regard. Climate change and its consequent increasing frequency and ferocity of natural disasters pose another great threat to our food and water security leading to outbreaks of diarrhoea, cholera and other water- and climate-borne diseases. According to the Inter-governmental Panel on Climate Change (IPCC) (2007), 20% of Bangladesh’s land area may be submerged with sea levels rising due to global warming. This will displace an estimated 20 million people making, one in every eight citizens, a climate migrant. A migration of this scale in Bangladesh, or elsewhere in the world, would create colossal social and health disorders. The magnitude of the climate crisis warrants international concern, and therefore I call for sympathetic global responses. We need to sustain and build on the achievement of MDGs for 2015 and beyond. The United Nations Conference on Sustainable Development (Rio+20) (June 2012) generated new hope and we should continue the dialogues to a fruitful end. I would conclude by saying that the Commonwealth Health Partnerships is a good initiative, which has potential for exploring opportunities of collaboration and partnership among the Commonwealth countries. I wish it success. 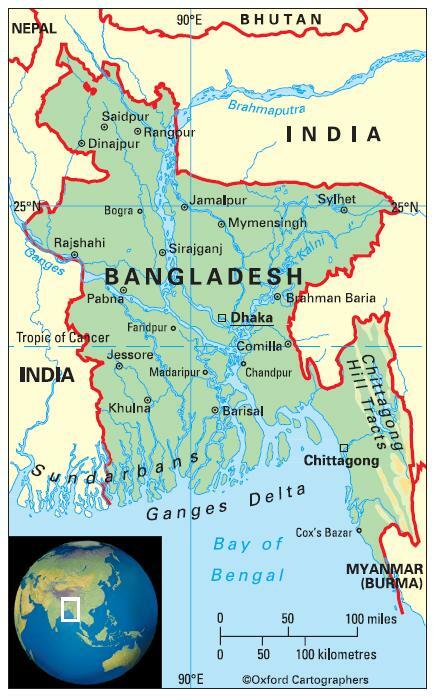 The People’s Republic of Bangladesh is a fertile and densely populated delta country in southern Asia bordered by the Bay of Bengal, India and Myanmar (formerly Burma). Tropical monsoon-type. Hot and humid April to October, with the monsoon running June to September. Cool and dry, November to March. The country is vulnerable to cyclones, which can be devastating – the cyclone of April 1991 killed 138,000 people. In November 2007, Cyclone Sidr hit the southern coastal strip of Bangladesh, killing many people and destroying thousands of homes. The most significant issues are severe overpopulation, high risk of flooding in large areas of the country, soil degradation and erosion, ground water contamination by naturally occurring arsenic and poisoning of fish by use of commercial pesticides. 154,695 (2012); the population density is among the world’s highest; 29 per cent of people live in urban areas and 14 per cent in urban agglomerations of more than one million people. The population growth rate stood at 1.7 per cent p.a. between the years of 1990 and 2012. In 2012 the birth rate was 20 per 1,000 people (47 in 1970), controlled by vigorous family planning schemes, and life expectancy was 70 years (44 in 1970). Bangladesh is classified as a low-income economy by the World Bank.